Travel Wrinkle-Free Without Carrying an Iron or Steamer! No need to look like you slept in your clothes with Wrinkle Wiz Spray. 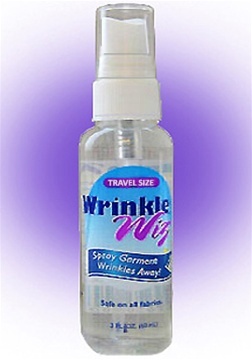 Wrinkle Wiz gets out wrinkles from packed clothing. Even with the best of packing techniques, some garments always come out of your suitcase wrinkled. The solution is Wrinkle-Wiz Spray. You really can look your best and pack light.